Miniature Slide | Products Lineup | Products | NIPPON BEARING CO., LTD. The NB MINIATURE SLIDE SYBS type is a limited stroke table with the most compact envelope dimensions, featuring two ball raceway grooves. The SYBS type utilizes balls as the rolling elements. The ultra compact design contributes greatly to the creation of smaller and lighter industrial machinery and equipment of all types. The NB MINIATURE SLIDE table incorporates a unique integrated ball cage between the table and bed. All components have been produced with high precision machining. The table height of the SYBS type is 3.2～4.5mm and the width is 6～12mm. This compact size when compared with conventional SLIDE TABLEs helps to realize the miniaturization of machinery and equipment. The ball raceway grooves of each of the bed and table are processed through simultaneous precision machining resulting in minimal processing errors, and bringing about extremely smooth, precision linear movement. Since the rolling ball elements do not recirculate, the frictional resistance will not vary significantly resulting in smooth, high precision operation. Additionally, the ball cage greatly reduces the contact noise of the rolling elements bringing about a low-noise operation. 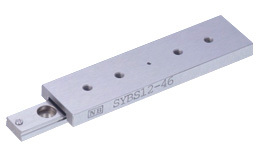 The SYBS type is made of all stainless steel components. This allows for use in corrosive or high temperature applications. The SYBS is a perfect component for vacuum or clean room environments.